Talk about soul (I had to, and I’ll explain why) – meet the fish that started it all, that lit that proverbial fire under the reigning Queen of French cuisine – yes, that would be the one and only Julia Child. 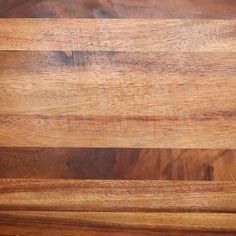 The story goes that she and her beloved Paul dined out one evening (or it may have been lunch) in Paris, she took one bite of the classic sole meunière he ordered, yes, he – and her eyes rolled back in her head, lightheadedness ensued and Paul had to prop her up all the way home – and Julia Child, as we’ve come to know her, was born – talk about soul food! And if Julia could cook in the studio, like she cooked in the kitchen, the Queen of Soul woulda’ had some serious competition. 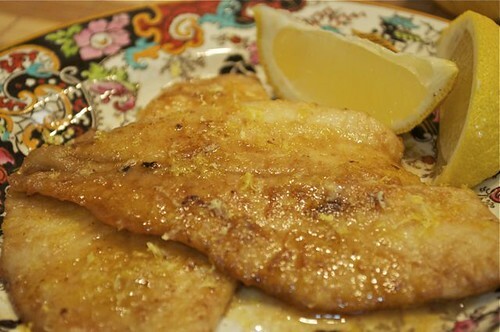 So get yourself some sole – it’s as versatile as the woman who played the woman who started it all and continues to inspire me every single day – hence lemon sole sauté – with lemon, thyme & parsley it’s sole meunière, with capers it’s sole doré, with spinach, white wine & onions, it’s sole florentine, with tomatoes & cream it’s sole duglère, with grapes & fresh tarragon it’s sole véronique, with a trip through an egg wash and breadcrumbs it’s sole colbert – and with what you like, it’s an original – so peruse the possibilities – baked, stuffed, poached, rolled, fried, steamed – however you prepare it – sole is the soul of sustenance from the sea. Translation? Sole is a blank canvas just waiting for you to write on the slate of how it will be served up today – and today’s special just doesn’t get any more special. 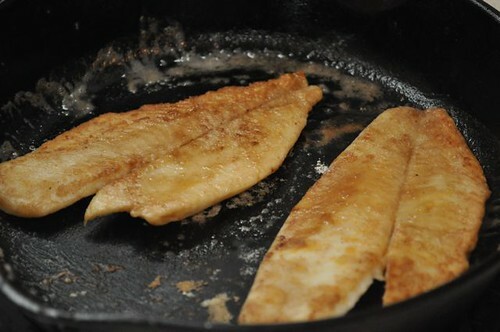 By the way, these ideas work with any mild, white fish – halibut, tilapia, cod, haddock, trout, orange roughy – so now there’s really no excuse to be bypassing the in the fridge counter now. 1. Get your defrosted sole ready to roll. I buy convenient in the freezer at my local football-field of-a-box-store and I’m always ready to go. But by all means use fresh. 2. 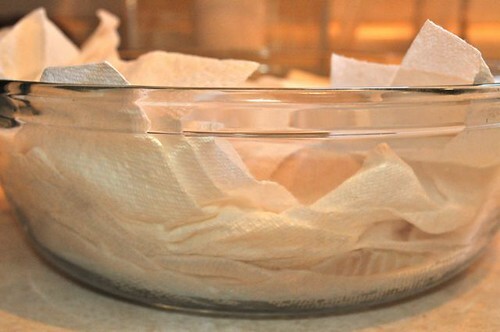 Take it out of the plastic and get a pile of papertowel ready to work. 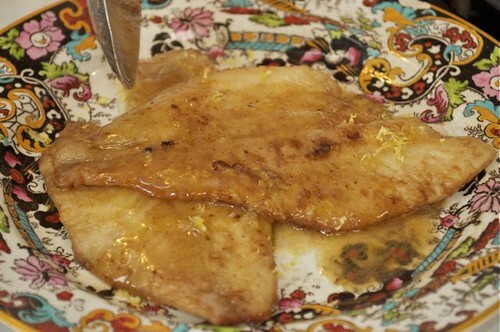 This is the secret to perfectly seared sole –getting it as dry as a Canadian winter. 3. 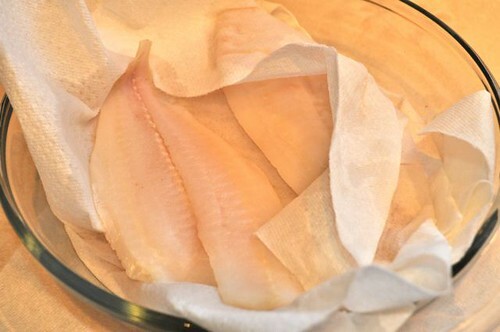 Unwrap as many fillets as you need, and keep the paper towel coming. 4. 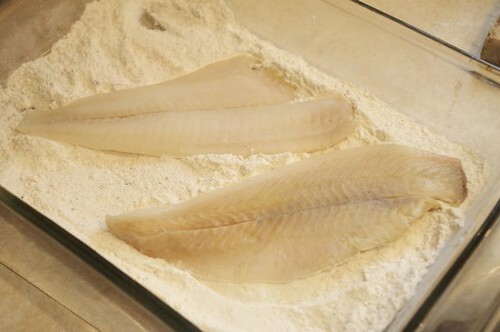 Just layer the fillets in a dish. 5. 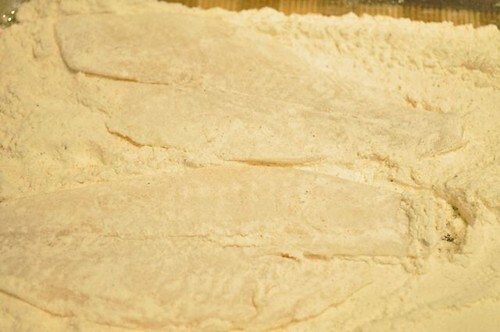 Keep the layers coming, cover and refrigerate until you’re ready to fry. 6. Get your dredging station ready. 7. 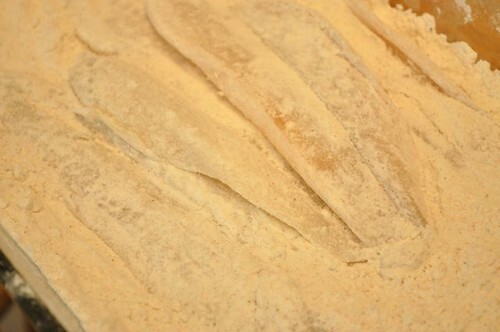 Lightly coat each fillet. 8. 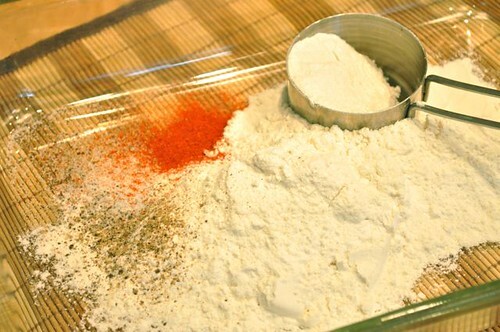 Turn over to coat both sides and shake off the excess. Set aside until you’re, that’s right, ready to fry. 9. 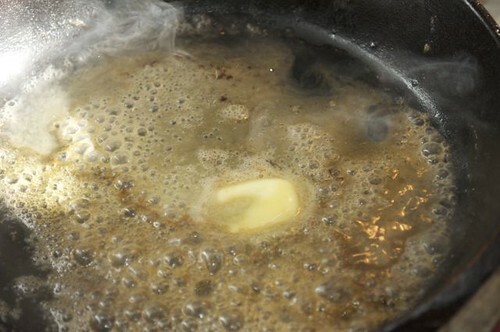 In the meantime, heat up a wide shallow pan until nice & hot and drop in a dollop of butter with a swirl of olive oil. 11. 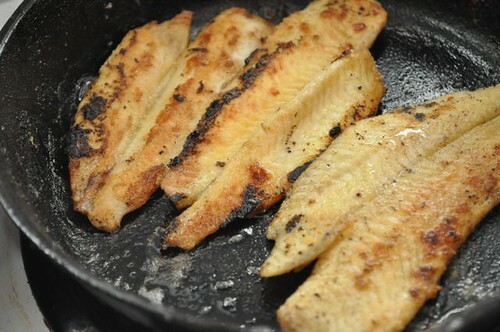 And dredging – set aside while you start to fry. 12. 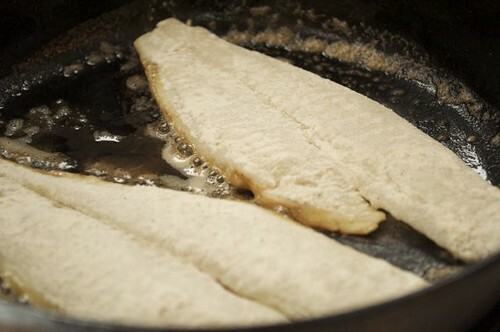 Lay as many fillets as will comfortably fit – make sure there’e no over lapping – if it’s not touching the pan, it ain’t gonna sear. 13. After 2-3 minutes, they’re ready to flip. 14. 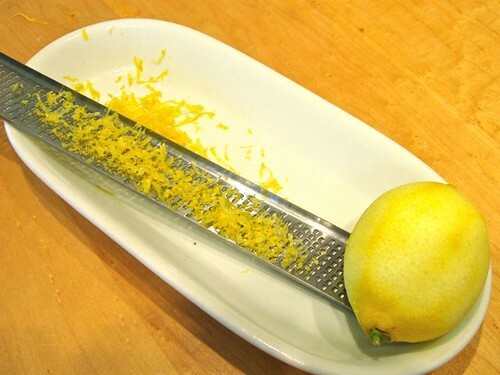 Zest a lemon – or more if you’re cooking for a crowd. 15. 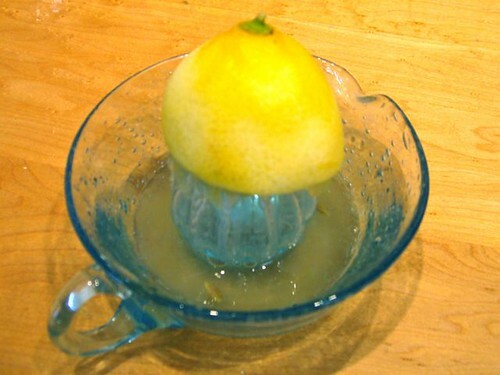 Juice a lemon – or more if that crowd is still hangin’ around. 16. 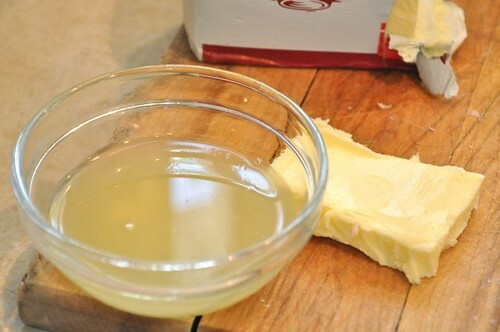 Add a tablespoon or 2 of the juice to the pan along with another bit of butter and a sprinkle of zest. 17. 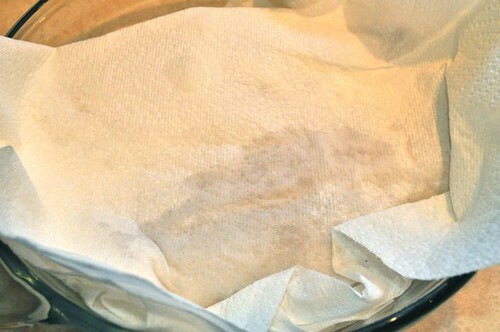 Remove to a plate and start all over again – remember? 18. 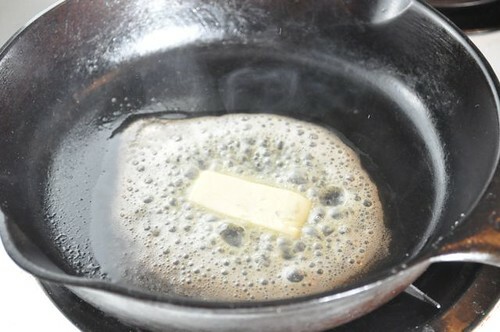 Add a little butter and a swirl of olive oil to your hot pan. 19. Lay your dredged fish in. 21. 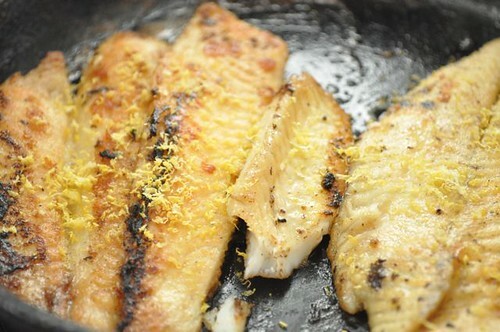 Juice, zest & butter said fish. 22. Plate and drizzle said fish. 23. 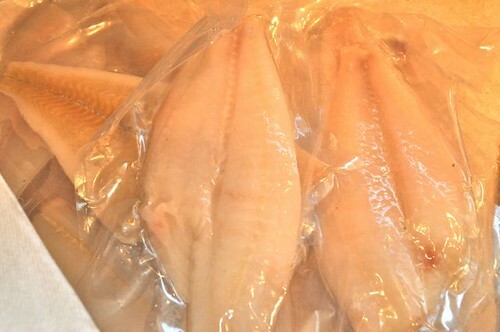 Consume said fish. So here’s to eating more fish. 5. 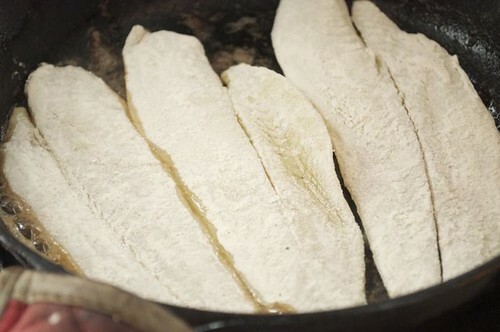 Lay in the sole fillets and sauté 2-3 minutes and carefully turn to repeat on the other side. 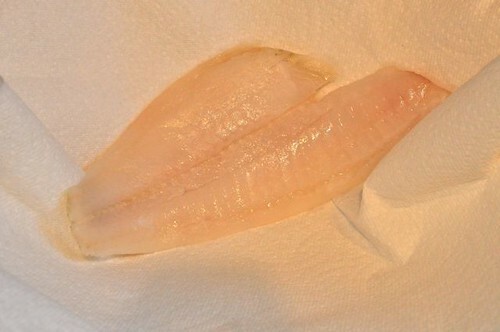 Remove to a warm plate. 6. 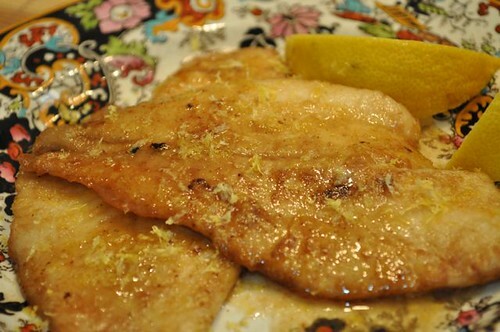 Drizzle the lemon butter mixture over the fillets along with a little zest. Serve warm.